Much like it did in Houston before last year’s Super Bowl, T-Mobile has rolled out network upgrades in Minneapolis before this year’s big game. T-Mobile touts that it’s been spending the last two years expanding coverage and increasing its LTE capacity by up to 35x in the Twin Cities. Network capacity grew by 7x in downtown Minneapolis and MSP airport, 8x in downtown St. Paul and the Mall of America, and 35x at the downtown Minneapolis Convention Center. And at U.S. Bank Stadium, where Super Bowl LII will be played, network capacity has increased by 30x. T-Mobile also rolled out LTE Advanced technologies like carrier aggregation, 4×4 MIMO, and 256 QAM to help boost speeds. 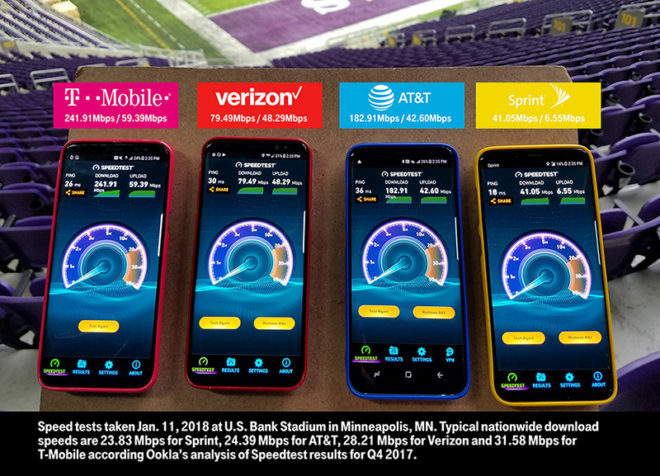 In a speed test conducted in U.S. Bank Stadium earlier this month, T-Mobile posted a download speed of 241.91Mbps and an upload speed of 59.39Mbps. Another notable upgrade made by T-Mobile was to deploy more than 120 small cells throughout Minneapolis, including at U.S. Bank Stadium and surrounding venues. These will give T-Mo customers additional coverage and speed and can be used to launch License Assisted Access in the future for added capacity and speeds. Rounding out the network upgrades made by T-Mobile was the deployment of a Centralized Radio Access Network (C-RAN) inside U.S. Bank Stadium. T-Mo says that this can increase upload speeds up as much as 40 percent in high traffic situations. The Super Bowl is a big deal in many ways, including as a test for a wireless network. There will be a lot of people at the game, including people traveling to Minneapolis from all over the U.S., and they’ll likely be using their phones a lot to share photos and videos and stay connected while at the game and in the days leading up to it. It’s important for T-Mobile to ensure that its network can handle all of the users that’ll converge on Minneapolis next month, and it sounds like T-Mo has made a number of upgrades to the network so it can do just that. Have any of you T-Mobile customers in Minneapolis noticed these network upgrades? Welcome to 2010 with those speeds, Sprint. I don’t understand why Sprint continues to perform poorly with all of that spectrum the company has in its aresenal. If their finances are in such despair, Sprint should consider selling 20MHz-40MHz of their 2.5GHz spectrum (Band 41) just to help cover some debt/network expansion. Verizon and T-Mobile may show immediate interest in that spectrum. Sprint’s parent company, Softbank, is already giving Sprint additional funds for network improvements. it’s because they are just sitting on the spectrum and not doing jack with it. I read an article this morning about Dr. John Saw, Sprint’s network chief, plans to deploy Massive MIMO using Sprint’s 800MHz, 1900MHz and 2.5GHz spectrum holdings on virtually every cell tower and build new towers to help fill in gaps. I have noticed that Sprint plans well, but the company is usually financially-strapped, slow or change plans in mid execution to execute any of their network expansion/improvement plans well. Only certain devices have a version of VoLTE, not true VoLTE capabilities and the holes in the network are pretty wide. T-Mobile has plenty of holes in their network as well, but I’m sure Band 71 will solve that problem in 2 years (once the TV broadcasters vacate those airwaves). Exactly! The gaps are closing quickly too not just with 700 but AWS and PCS so more towers are needed just to relieve congestion. Att knows how to cover NE Ohio. When i had cricket it seemed liked i had full bars everywhere on my iphone 6s plus, Even in rural areas. Tmobile does enough just to get by. It has some holes but has gotten better. Excuses. They can co-exist their equipment on current towers in the area owned by Crown castle, american towers and sba communications. How? Cell tower companies all lease their towers out to cell phone carriers. That would be more cash in the pockets of CC, AT and SBA. They collect the rent payment directly from the carrier. Probably not the same attention, because it doesn’t get the same national attention that the NFL does. Email john.legere@t-mobile.com and see if they have. They will most likely work on it. Should have 5G there by then. And where is here ? I’m pretty impressed with AT&T seeing as they have barely taken advantage off all their resources to boost speeds. I’m impressed with AT&T also because that company has almost as many customers as Verizon and can still provide that much speed. Verizon needs more spectrum deployed. I can obtain a signal almost anywhere with Verizon but the data speeds have declined significantly. I’m looking forward to T-Mobile deploying their Band 71 spectrum natiownwide (once the TV broadcasters are completely off), so I may give T-MOBILE another look afterwards. Verizon is definitely doing upgrades. I had to do a job last week at Montclair State University. I did a speed test on my work provided Verizon with a Google Pixel 2 XL. Had a strong -85dbm signal Band 4. Clocked in at 230MBit/sec! I have strong Band 4 signal -97dbm, but I clocked in at 68.02 Mbps. This is in Jackson, MS at my house. This is still great, but at work sometimes, which is in the downtown area, I notice my signal buffers and it never buffered before. Also, there are times my phone bounces to a 3G signal. I have an unlocked Note8. I guess I have to wait on these new Verizon network upgrades to come to my area. Heres my main issue with Verizon and why I refuse to use them. They cap video streams at like 10mb or something along those lines simliar to how Sprint has all these restrictions for bandwith in their plans and it erks the heck out of me. I use AT&T and T-mobile as my two phones and pridomnenly rely on my AT&T line as I had it first growing up and they tend to have the overall better coverage in my experience/ call reliability is better. Also I hate how Verizon still hasn’t repurposed its 3g and 1x for LTE. They should just get it over with already since 3g is useless and inefficient compared to LTE as well as the fact that their legacy network tech does not play nice with international phones. I wish Verizon would repurpose their 2G/3G spectrum now as well. The last date I found when Verizon plans to shut down those old networks is December 31, 2019. I don’t like Verizon’s voice quality compared to T-Mobile’s, but I figured it will improve once there is more VoLTE interoperability. I haven’t noticed the data caps on video, but I do have an old unlimited plan that I kept. I really like T-Mobile, but in the South and other rural areas, their network has holes. For example, I can drive on the I-55 in Jackson MS, and before I turn off to work, I hit a deadspot. On the interstate; really!? Just plug the hole. When I drive home, I hit another deadspot with T-Mobile. I was literally changing my drive paths to get to and from work when I was on a call to maintain that call. That shouldn’t be my job, I paid T-mobile for that. So I decided to use my old Verizon plan full time and come back to T-mobile once it has improved. My partner has T-Mobile and when he goes to his house in Georgia suburb of Atlanta, he loses signal with T-Mobile. T-Mobile is great in certain cities, but there are spots in the several cities and many rural areas that still need to be addressed. I know we can easily say that all wireless carriers have deadspots, but I find it happens more with T-Mobile. I have not been with Sprint in a very long time, so I cannot speak about its network improvements. AT&T and Verizon reign supreme in the South and in rural areas. I’m waiting for T-mobile to take this area and rural areas more seriously, and I believe Band 71 is going to be their weapon of choice with other network improvements (carrier aggregation, LAA, 4×4 MIMO, etc.) in preparation for 5G. Email john.legere@t-mobile. com and tell him (his team) exactly where those dead spots are. Chances are they already know about them, but your interest in getting them plugged will help. I have seen success with this approach throughout Utah. They usually email me back within a day or two and give me a network update for the spots i mention and what they plan to do about it. At least it should give you an idea of when those holes might be plugged and you can try T-Mobile out again. Band 71 is the most likely weapon to use and that will require you to get a new 2018 phone. Not all phones released in 2018 will be band 71 capable, in fact most of them are likely not going to be. There were also 2 phones released towards the end of 2017 that are band 71 capable, the V30 and S8 Active. The V30 and S8 Active are the only phones currently available that will work with band 71. Of course! I didn’t know I had to be so specific. There will phones released in 2020 that probably don’t support 600mhz. It is happening slowly. Last summer I was in rural Georgia north-west of Albany and on the rural farm roads I saw my Verizon phone say it was on Band 5 LTE which I believe is re-farmed from 850MHz CDMA. In my hometown of Bensalem, PA at this Redners I go food shopping at, Verizon was always very weak inside, switching between -117dbm Band 13 LTE to 3G EV-DO. Just last week I went inside there and saw a blazing strong -85dbm Band 4 signal and tested it to about 90MBit/sec. T-Mobile has made the competition strong and it looks like everybody is doing their network upgrades! This year will be very exciting for everybody! These are not your typical towers…these are probably smaller antennas that cover a smaller area. I got close to 130 Mbps in Edina, about 10 miles away from U.S. Bank Stadium, on my GS7 edge. Aren’t you a great person. In my area (Richmond, VA), I never have to wait for things to download. I click a link and its ready. I’ll do a speedtest later if I remember but it’s never slow. so what makes people think band 71 600 will make any difference like band 12 did NOTHING BAND 4 is the power house improve on that with reliving CONGESTION. Band 71 will do something because T-Mobile has more of it. 10×10, 15×15 or 20×20 bandwith in some areas. Band 12 was only 5×5 bandwith in all areas, so a Max of 37Mbps. Band 12 had range but it could not carry much data without congestion. Band 71 is going to be much better, but the TV broadcasters have to vacate that space first. Also, T-Mobile has to aggregate that spectrum with it’s other bands. 4-way carrier aggregation. Do phones even support that yet? I read Samsung’s new Exynos chip does, but that doesn’t help us in the United States because we only use Snapdragon chips for most Android devices. Band 12 did a lot! When you look at speed you’re only looking at one aspect of the network. It is certainly true that band 12 did not do a lot for network speed. However, another aspect of the network is area covered (or coverage). Band 12 travels further and penetrates objects better than the higher frequencies in use. This allowed T-Mobile to significantly improve coverage without the expense of adding many more towers. In many areas, the population density is not high enough to justify the expense of new towers. So, low frequency bandwidth is the only practical solution in these areas. Band 12 helped tremendously in my area. no clue.